They went into one of the toughest places to play in the country, and found a way. The Bruins defeated Arizona on Saturday night 77-72, which was their biggest statement win of the season. The Wildcats had won 70 of 71 straight home games coming into Saturday’s game, and 21 in a row. However, the Bruins dominated the offensive boards, and used a big 19-4 run in the 2nd half to take down Arizona. Thomas Welsh scored 12 of his 14 points in the 2nd half. He was one of 5 Bruins in double figures. Bryce Alford had 15, TJ Leaf and Aaron Holiday had 12 each, while Lonzo Ball had 11 points and 8 assists. UCLA had a rough ending to the 1st half, missing 7 of their last 8 shots, as Arizona went on a 10-1 run in the final two minutes. The Bruins had been up by as many as 7, but they found themselves trailing 43-39 at halftime. The Bruins decided to play some defense in the 2nd half, switching to a 3-2 zone, which slowed down the Wildcats. They also outrebounded Arizona 9-1 on the offensive glass in the half. UCLA stretched the lead to 11 twice late in the game. The last at 73-62 on Welsh’s’ inside basket with 4:38 to play before Arizona managed one final charge finishing the game on a 10-4 run. Arizona cut the lead to 75-72 with 29 seconds left. Aaron Holiday missed the first of a one-and-one free throw, which gave the Wildcats a chance to tie. However, Kadeem Allen air-balled a three-pointer in the final seconds. Allonzo Trier had a career-high 28 points in the losing effort. The win tightens the Pac 12 race and likely puts Oregon in the driver seat to win the Pac 12 regular season title. Oregon and Arizona are tied for 1st, but the Ducks own the tie-breaker by virtue of winning their head-to-head matchup with the Wildcats. Arizona has one game left at Arizona State, while Oregon’s final game is at Oregon State. As for the Bruins, they are now 1.5 games out of 1st place in the conference, with two games left against the Washington schools. UCLA is still likely to finish in 3rd place, which sets up a very important Pac 12 Tournament. The Bruins would potentially face Arizona in the semi-finals and Oregon in the finals. A #1 seed in the West Region would be on the line for the NCAA Tournament. It’s a tough road but after Saturday, UCLA gave us reasons to believe they can beat anybody on any floor. It was easy to look ahead to the big showdown Saturday at Arizona. The Arizona State Sun Devils nearly took advantage of that, but UCLA held on to beat ASU 87-75. 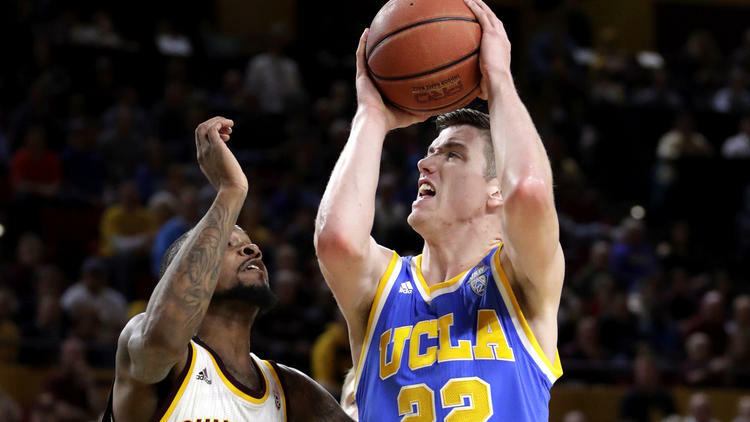 TJ Leaf lead the way with 25 points and 8 rebounds in the Bruins sixth straight win. UCLA also got 17 points from Aaron Holiday, and 15 from Bryce Alford. The Bruins are known for their up-tempo offense, but on this night it was their size that wore down Arizona State. They won the rebounding battle 49-30, and outscored ASU 50-22 in the paint. UCLA also held the Sun Devils to 38% shooting despite the Sun Devils connecting on 14 three-pointers. Shannon Evans II had a slam dunk that put Arizona State up 50-49 with 15:22 left in the 2nd half. However, UCLA went on a 14-5 run from there, which was capped by an Aaron Holiday three-pointer. Holiday had what felt like a dagger with 7:29 left, nailing another three-pointer. That put UCLA up 74-60, and Arizona State went quietly after that. Torian Graham led Arizona State with 28 points and Kodi Justice added 19, but it wasn’t enough. The Bruins kept their win streak alive on a quiet offensive night from Lonzo Ball, who scored just 4 points, but did contribute 5 assists and 11 rebounds. The Bruins can still finish in 2nd place in the Pac-12, and possibly even improve upon their #5 ranking with a win at Arizona on Saturday. They’ll need Oregon to lose a game or two as well, but a win against the Wildcats would do wonders for their confidence in their chase for a National Championship. For the first time in about two years, the Bruins looked like a basketball school against their cross-town rivals. 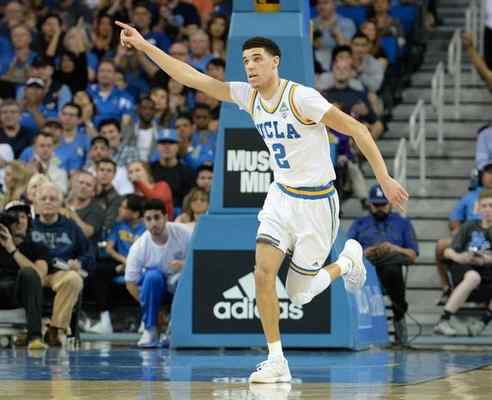 #6 UCLA routed the Trojans 102-70 on Saturday Night at Pauley Pavilion. The win snapped a four game losing streak against the Trojans on the hardwood, including an 84-76 loss at USC last month. The Bruins improved to 14-1 at home, and are now 5-0 in the month of February. 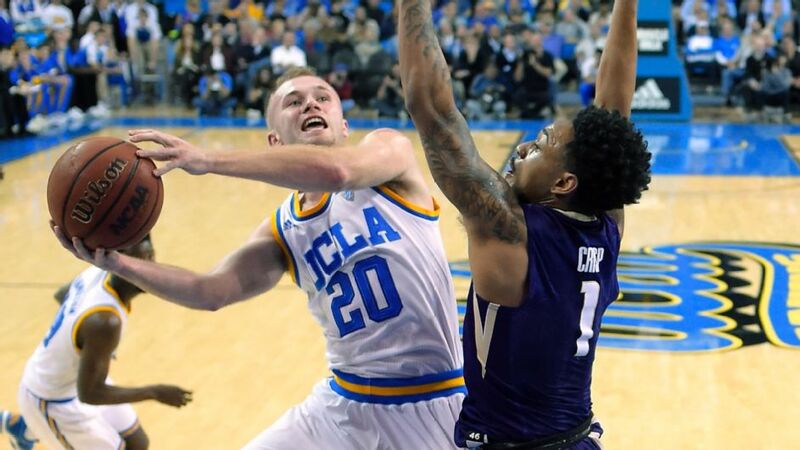 Bryce Alford led the way for the Bruins with 26 points, including 10 straight in the second half, along with 5 three-pointers. All five starters were in double figures for UCLA, including Lonzo Ball, who had 15 points, 8 rebounds and 8 assists, as well as TJ Leaf, who scored 19 points to go along with 8 rebounds. Thomas Welsh contributed a career-high 16 rebounds too. 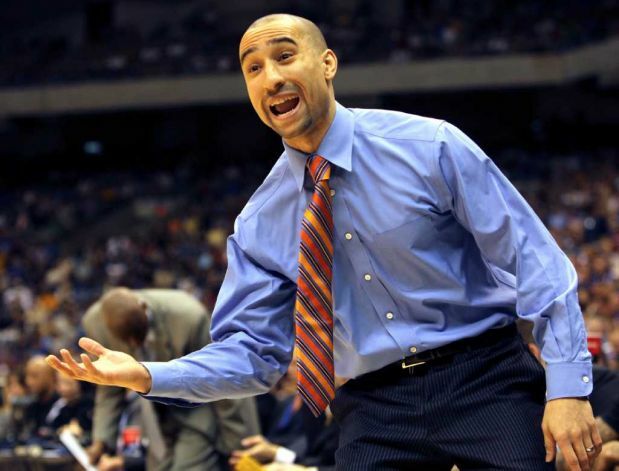 Not much went right for USC, who was led by Bennie Boatwright’s 20 points and 10 rebounds. Boatwright, who didn’t play in the first meeting between the Bruins and Trojans, didn’t get much help from his teammates. USC shot only 34% from the field, and got crushed on the boards by a margin of 50-33. With 8 minutes left in the first half, UCLA went on a 17-3 run. That run was capped by a deep Lonzo Ball three-pointer, which gave the Bruins a 46-34 lead at halftime. That’s the fourth time this season that Ball has hit a deep three-pointer in the final seconds before halftime. The Bruins have won all four of those games. Everyone will look at the 100 points and believe the Bruins won this game with their #1 ranked offense in the nation. 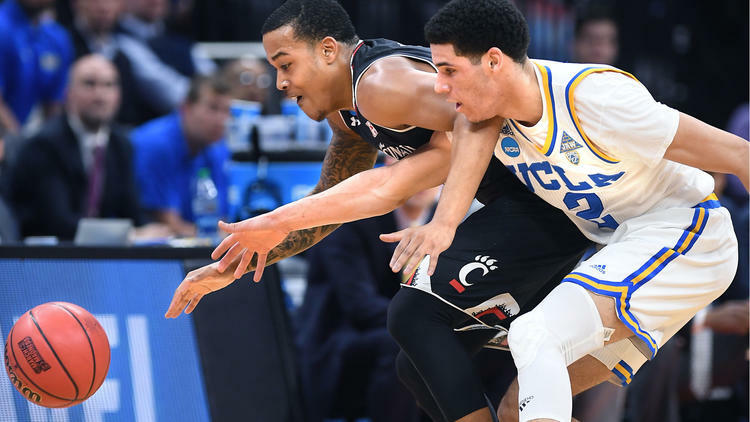 However, it was really the effort on the defensive end, and on the glass that was the biggest difference in UCLA’s win, as well as in the last three weeks. Those are things the Bruins will need to continue if they expect to compete for a National Championship. February 12th, 2017Lonzo Ball is now taking over on both ends of the floor. His evolution continued against Oregon State on Sunday, as UCLA ran away from the Beavers with a 78-60 win.Ball had 22 points and 9 assists, while TJ Leaf added 13 points in a game that UCLA led by only 5 points at the end of the first half.The Bruins shot 52% on the way to their fourth straight win, but it wasn’t easy in the early going. UCLA was trailing 27-24 with three minutes left in the half. They managed to score the half’s final 8 points, but played with little energy in the game’s first 20 minutes.UCLA broke the game open in the 2nd half with a 14-3 run, and with 5:37 left they had their biggest lead of the game at 71-48. The run was sparked by a full court press that the Bruins unveiled for the first time this season. 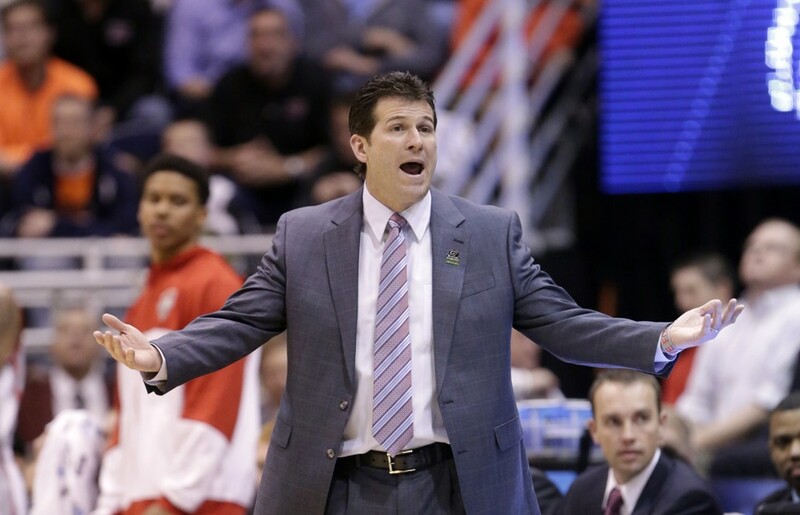 They held the Beavers to 40% shooting for the game.Bruins Coach Steve Alford was pleased with the effort, but stressed the importance of keeping it in perspective. “There’s obviously been a lot of talk about our defense, which after doing this for almost 26 years, it’s almost comical because other teams aren’t critiqued like we are,” he said. “It’s who you are as your identity. Our team is a very efficient offensive team. Yes, we do want to continue to improve defensively, that’s a huge key for us. But we’re not all of a sudden going to start playing a 50-possession game to hold people in the 50s.”The win gave the Bruins a weekend sweep of the Oregon schools at home. It was also their first season sweep of OSU since 2012. The last time the Bruins played the Beavers at Pauley Pavilion, the suffered an 85-82 loss on March 5th, 2016.UCLA maintained its grip on 3rd place in the Pac 12, and will now get ready for a showdown against USC next week. The Bruins will try to avenge an 84-76 loss to the Trojans last month. 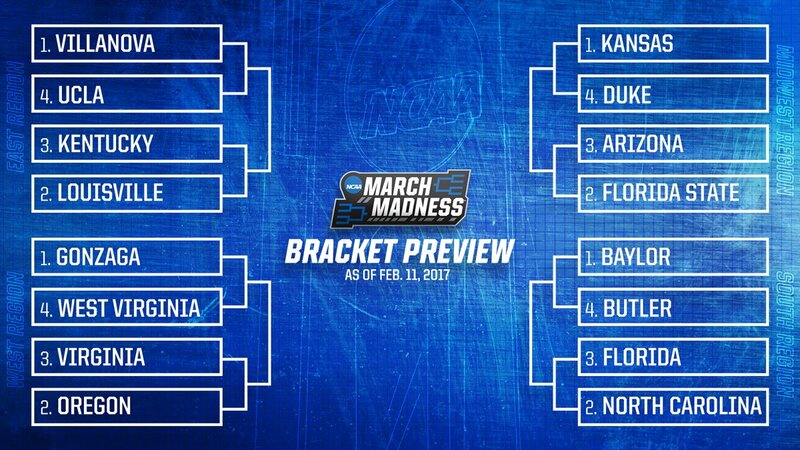 February 11th, 2017Remember when you thought the Bruins were going to be a #1 seed in this year’s tournament? Well the odds of that happening now are about as good as going a whole day without hearing anybody talk about Donald Trump.For the first time, the NCAA released a midseason preview of what the top four seeds would look like in each region if the tournament started today. The Bruins were the fourth seeded team in the East Region. That region also had Villanova, Louisville, and Kentucky as the top three seeds. Villanova was the #1 overall seed, with Kansas, Baylor, and Gonzaga as the other three #1 seeds.The real problem for UCLA is Oregon and Arizona, who are likely to finish ahead of them in the Pac 12 standings. Even after defeating Oregon on Thursday night, the Ducks were the #2 seed in the West. Arizona, who was recently defeated by Oregon by 27 points, is a #3 seed in the Midwest.UCLA is 2 games behind Arizona for 1st place in the conference, and 1 game behind Oregon. The Bruins get to play Arizona 1 more time during the regular season, but Arizona and Oregon don’t play again. That means it would take a Hillary Clinton like collapse by The Wildcats and Ducks to be passed in the standings heading into the Pac 12 tournament.The committee didn’t seem to put much weight into recent wins when they came up with their rankings. North Carolina was still a #2 seed despite losing to Duke on Thursday. 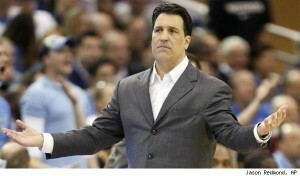 Florida hammered Kentucky a week ago, yet they have the same #3 seed as Kentucky, who also lost at home to the Bruins. It’s also strange that a team like West Virginia, who has 5 losses and 2 against teams rated outside the top 75, has the same #4 seed as UCLA.The best hope for the Bruins is to get hot in March and win the Pac 12 tournament. That might get them a #2 seed and slightly closer to home in the West Region. The Bruins will try to keep things rolling tomorrow afternoon at home against Oregon State. 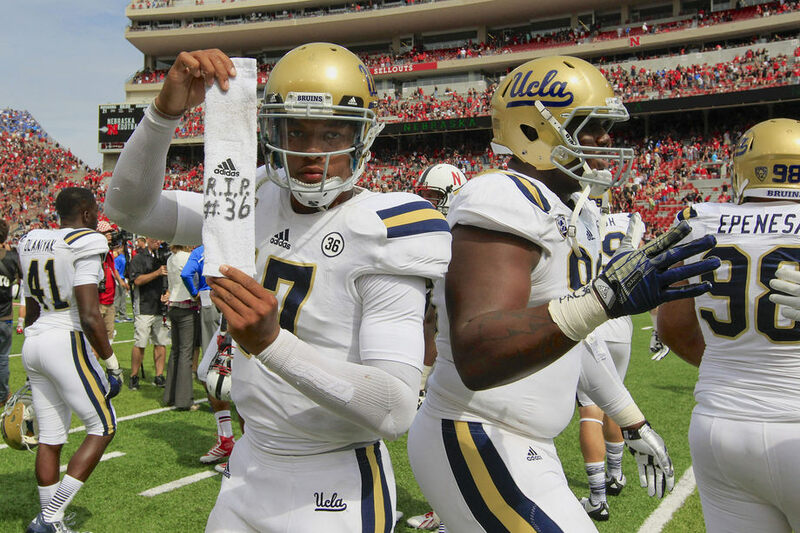 I would have loved to have been a fly on the wall in the UCLA locker room at halftime of their game against Nebraska. The Bruins were trailing 21-10 in Lincoln, and were being dominated. In fact, it was 21-3 up until the final minute of the first half, before the Bruins started to wake up. This might have also been because kickoff was at 9 am Pacific Time, which is usually about the time that most college kids are still recovering from their hangovers. Then the Bruins scored 28 unanswered points in the 2nd half to defeat the Cornhuskers 41-21, and improve to 2-0 on the season. In a post game interview that Jim Mora Jr did with AM 570 Fox Sports LA, Mora said that there weren’t really any adjustments to make at halftime, and it was simply a matter of focusing and executing better. What he really meant, was that he had to tell his players to wake the hell up and start playing the way they know how to. It’s a good thing they did, because this victory was a tribute their former teammate Nick Pasquale, who was killed last weekend after being hit by a car in San Clemente, CA. The Bruins wore number 36 patches on their jerseys to honor Pasquale. 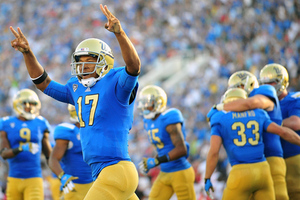 The Bruins were once again led by quarterback Brett Hundley, who had 294 yards passing, to go along with 3 touchdowns. Hundley did have one interception, but also tacked on another 61 yards rushing. 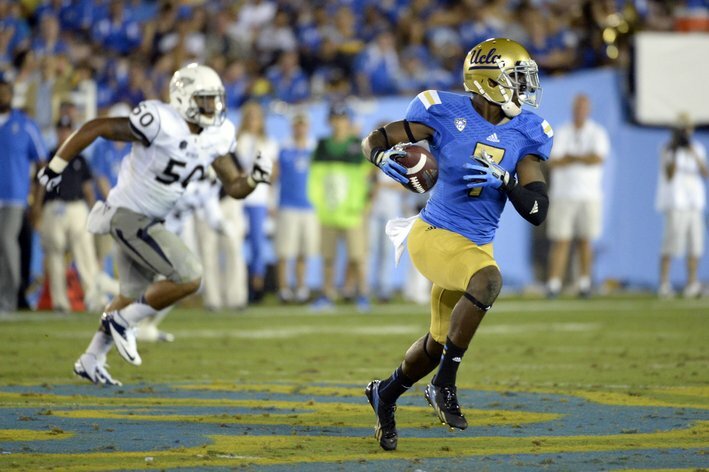 Jordan James was effective running the ball again for UCLA, rushing for 105 yards and a touchdown. The 35 point explosion began with a 10 yard touchdown run from Paul Perkins with under a minute left in the first half. The Bruins then opened the 2nd half with an 89 yard drive down the field, capped off by a 3 yard touchdown run by James. After the Cornhuskers went three and out, the Bruins put together another 57 yard drive, ending in a 28 yard touchdown pass from Hundley to Shaquelle Evans. That gave the Bruins the lead for good, and Hundley would go on to add two more touchdown passes for good measure. Mora said “our aim is to be special. Our aim is not to be average.” The Bruins definitely looked special on Saturday afternoon, winning on the road against a a team that had won 14 straight non-conference home games, and 10 home games in a row. All of this coming during a week in which they attended the funeral of their former teammate, Pasquale, and playing with heavy hearts. The Bruins are off to a nice start, but the road ahead will not be easy. They should handle New Mexico State at home next week, but will have a much more difficult stretch against Cal, Stanford, and Oregon. In the meantime, UCLA should feel very good about honoring Pasquale in the best possible way. The UCLA football team opened their season in spectacular fashion on Saturday night at the Rose Bowl. The Bruins pounded Nevada 58-20 to kick off a season that is beginning with high hopes for the UCLA faithful. The Wolf Pack put up a good fight in the first half, but the Bruins exploded for 41 points in the 2nd half to cruise to an easy win. I would say I had the pleasure of seeing this victory first hand, but considering it was nearly 90 degrees with 61% humidity at game time, I think I was just fortunate that I didn’t die of a heat stroke while attending the game. Nevertheless, Bruins quarterback Brett Hundley put up video game like numbers against Nevada, as he finished with 274 yards passing, to go along with 2 touchdown passes, and 2 rushing touchdowns. If he keeps this up, he might have a chance of getting invited to NY this winter for the Heisman Trophy ceremony. Even more impressive was the Bruins running game. One of the biggest question marks for this team coming into the season was how they would replace running back Jonathan Franklin. At least for one night, that question was emphatically answered by junior Jordan James, who rushed for 155 yards on 21 carries, while adding a touchdown. James got plenty of support from his teammates too, as Hundley rushed for 60 yards, freshman Paul Perkins rushed for 55 yards, and the Bruins ran for a total of 345 yards. Bruins fans are definitely loving it. Although you might not have been able to tell from the less than capacity crowd that showed up. The attendance was announced at 60,562 , which is far less than its capacity of over 90,000 . Much of this can be attributed to UCLA not actually starting classes until late September, which usually limits the crowd at the first game. Also, the heat was brutal. Many of the prime tailgating spots were vacant right up until game time, and many people probably didn’t show up at the Rose Bowl because they feared they were going to melt. As for the Bruins, there are still questions that need to be answered on the defensive side of the ball. The secondary has been rebuilt, but it was pretty untested in the season opener. UCLA had a knack for giving up huge plays last season at very inopportune times. Against Nevada, they didn’t give up any huge plays, but they did surrender 353 yards to scrappy Wolf Pack quarterback, Cody Fajardo. They’ll need to tighten things up in the coming weeks against better competition. UCLA will have a bye next week, then travel to Lincoln to take on 18th ranked Nebraska on September 14th. The Bruins have a tough road ahead of them, including road games against Stanford and Oregon in October. Vegas lists the over/under on Bruin wins this year at 6. That’s right….6 games! As tough as the schedule is, I can’t see this team winning less than 8 games. The Bruins played 11 freshman yesterday in significant roles, and although inexperienced, they appear deep and talented. Something big may be Bruin in Westwood.